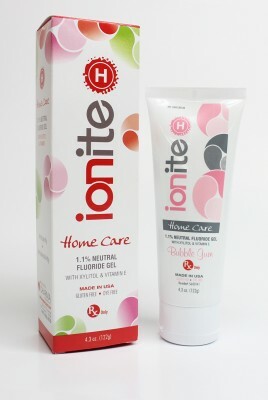 • Ionite-H Home Care is a prescription strength 1.1% neutral sodium fluoride dentifrice with maximum fluoride protection (5,000ppm) and sensitivity relief (5% potassium nitrate). • It helps prevent caries, gingivitis and treats sensitivity. • Exclusive Formula that combines sodium fluoride with tri-calcium phosphate and potassium nitrate. It provides great resistance to acid challenges. • It is a thixotropic dentifrice that can be applied with a toothbrush or a fluoride tray. It is ideal for treating hypersensitivity before and after whitening procedures. It is recommended for patients with intolerance to acidic fluorides due to xerostomia, bulimia, radiation systemic disease and chemotherapy. • Specially formulated flavors to prevent bitter aftertaste and to give patients a pleasant taste. It is gentle on bridges, crowns, composites and other aesthetic restorations. • Ionite-H is the only dentifrice that contains Vitamin E which provides beneficial antioxidant effects and serves as a natural desensitizing agent.